Until November 2015 when his now ex-wife, Naghmeh Panahi, accused him of psychological and sexual abuse, Pastor Saeed Abedini was the face of Christian persecution as he remained a prisoner for his faith in Iran. Since Panahi's explosive revelation just weeks before his release from prison in January 2016, however, Abedini has endured both public and private turmoil. He lost his home and his wife and children in a messy divorce that was finalized in April and his reputation has been questioned. Just around the time his divorce was made final, Abedini also began publicly lashing out on social media about the people he blames for railroading his life and ministry. In a transcript of his divorce hearing acquired by The Christian Post between the pastor and his former wife, Abedini delivered a more coherent narrative which paints him as the real victim in testimony beginning at page 176 in this extract. He challenged testimony offered by Panahi who argued that she was the victim of repeated domestic abuse, claiming that she lied to get him arrested during a 2007 incident for which he was made to plead guilty to a misdemeanor. "The day after that in the morning it happens a lot between us. When she gets angry she cannot control herself. And she told me so many time that when I get angry I cannot control myself. But after that when she sees, she start destroying me. She feels so bad about it and she came and kind of, like, knee down on me, my feet, start crying. Kissing my legs even with tears and said please forgive me I know what I did," Abedini told the court. "So the day after that when I was in jail I saw on a camera, maybe you have the records here, he (sic) came and she said to the judge that I never touch her. I never did that things so the judge let me go," he added. He explained in his testimony that most of his struggles stemmed from a fight for control of more than 200 pastors and 100 underground churches he started in Iran prior to marrying and moving to the U.S. with Naghmeh. "I find it out Naghmeh uncle, Naghmeh's dad and Naghmeh's pastor tried to take over the churches and introduce these churches as their own churches to fundraising. And I know they fundraise nearly a million dollars. And so that make me so angry," Abedini said. He said he was attending Calvary Chapel in Boise, Idaho, with his ex-wife and disgraced Pastor Bob Caldwell, who led the church at the time, which created conflict in his marriage in the fight for the churches. Caldwell confessed to living an adulterous lifestyle last fall. "I left that church because of the corruption and I saw that he wants to bring the churches that I started under Calvary Chappal (sic) Boise (inaudible). So I try to stop him to not let him do that and then he attacked me physically in his office. Grabbed my neck, wants to punch to my face. And he always use Naghmeh to go and say to other people negative things about me. Because he find out that I am saying something wrong about his church, especially this pastor team," he said. Abedini said Panahi's father, Homy Panahi, used to be a high-ranking Muslim official with the Iranian government until his radical Christian conversion so his family had become deeply connected with the Christian community in Iran as well. He said Panahi's family wanted him to appoint her cousin as leader of the churches he started in Iran but he rejected the idea. "When I came to United States and she said you need to explain to the churches that my cousin going to be the pastor. I said I don't do that because I know Bob Caldwell wants to make him pastor and then remove me from the leadership and make them Calvary Chappal and I don't let him to do that. I know his evil plan. But Bob called. Every time he was calling him and her and pushing her, Naghmeh, to do that," Abedini explained. The day they had the disagreement in 2007, he said it was over the churches and she was pushing him to give them up to her cousin at the request of her then pastor. "She loves him, she believes him a lot as her pastor. But I saw this guy has a problem. And so he did it and then I just got my laptop and went to my [home] office, kind of like escaping like a cat from dog. And she came and bug me, not even not letting me go to my office," he recalled of the incident. "And I knew that she does — she wants to make it like a physical conflict again as she did before. So I just want to escape. And then finally I just kneel down and went to my office and lock the door," he continued. It was at this point Abedini said his wife threatened to get him arrested by claiming she had been assaulted. "She came and she knocked on the door and said Saeed if you don't say that [he will give churches to cousin] I will call 911 and I will tell them that you beat me. And they are going to come and arrest you. This is America, this is not Iran. If a woman call the police and say someone is beating them they don't listen to you they are going to come and arrest you," he said. "For me it was like a joke. I was like, I am escaping from it and locking myself in the door. If they come and arrest me — I said okay, if this is America, let it be America. I never do — that because I don't believe he is qualified," Saeed said. "Your pastor is trying to steal my churches." He said at this point Panahi kept threatening to call the police on him until she finally did when she didn't get her way. "She start counting, one, two, three, if you don't come out I will call police. I said do whatever you want to do. No one can push me to what should I do or not. So she called 911 and she start like that oh, he's beating me. Come save me. Help me," the pastor said. He said he could not believe she would do something like that to him. "I was like wow, she is kind of, like, really crazy. I never could believe she does that. So she did that and still I was in office. And then police came, knocked on the door and said open the door, sir. I was like — I explained the whole situation the same as I am doing right now. I didn't touch her. I didn't even yell at her. That's a story. So they said this is our policy we will take you to the jail and you can say it to the Court," he said. Abedini said Panahi's lying about the incident eventually came to light but he pleaded guilty to a misdemeanor partly because he didn't understand what was happening legally and because he didn't want his then wife to get in trouble for filing a false report. "She hired a lawyer and she said the whole thing to the lawyer and my lawyer said if the Court wants to — wants me to come and testify I will do that. That Naghmeh never — didn't say a lie. But he advised us to not say the truth that she lied because it's going to be recorded as a false report to the authority," he explained. "And so he said I am going to make it through that you don't have any problem and Naghmeh doesn't have any problem because she lied to 911. I didn't know I got guilty until I got free actually," he said, pointing to the charge of disturbing the peace for which he pled guilty. It was after that incident, frustrated by what he was dealing with at home, that Abedini left to be with family in California. "After that, you know, I lost everything as a person. I started the largest church in Iran Christianity history. I saw so many wolves come to attack and take away from me. And I was always fighting with them. And most of them were American pastors, like her uncle, her dad and her Pastor Bob Caldwell, which we recently found out he has been in affair with someone. They remove him from authority of the church," Abedini told the court. "When I came here I was just always fighting with these things. So I lose everything about Bob Caldwell did this to me and using her against me. And that was the first time that this conflict got worse and worse among us," he said. Reacting to Panahi's claim that just a year after marrying Abedini in November 2005, he administered a beating on her in Dubai while waiting for his visa to be processed so he could move to the U.S., he said he was defending himself from outrageous behavior. "In Dubai we were talking with our leaders on Skype and then I had an invitation to go to Qatar to speak in a church. And I was packing my suitcase and we got a conflict and she came and just — she throw everything in my face from my suitcase," he recalled. "And then she start, kind of, like beating, punching to my face. And then I just grabbed my face, but she just keep continuing yelling and throwing things to my face and punching to my face. You can't do these things," he said. "She was very controlling. And so I just start counting. I said God, if she does it more than 24 times this time I am going to stop her. And she did it like 24 punches to my face and yelling. So I grab my head and cover it and she was just doing — throwing things on my head and you know punching to my face. And then I was counting. One, two, three, four, five. So it became 24 and then I stop her," he said. "And so she called it as I attacked her." Panahi claimed, however, that she simply threw a shirt at her ex-husband before he exploded. "He got very angry. He started beating me very badly. I had bumps coming out of my head. Bruises all over. Kicking and hitting, and I thought I was going to die. I was screaming and yelling," she said in another portion of the transcript. Abedini served over three years of an eight-year sentence in Iran for the supposed crime of endangering national security, though advocates for his release say it was because of his Christian faith. Abedini is a Muslim convert to Christianity and was in Iran working on building an orphanage when he was suddenly arrested in 2012. He endured physical, emotional and psychological abuse during his imprisonment and did not renounce his Christian faith to escape punishment. 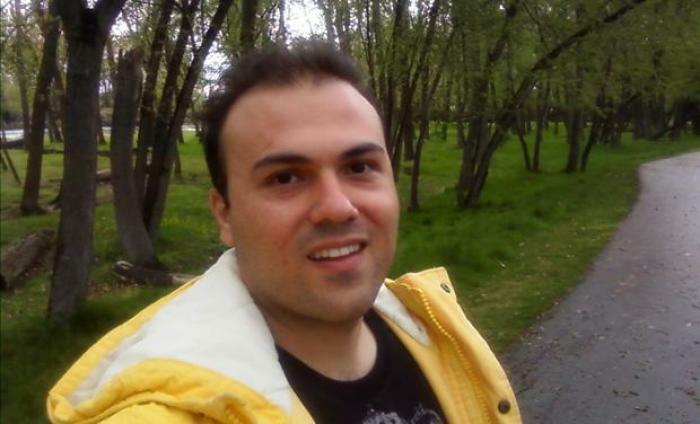 Abedini, a naturalized U.S. citizen since 2010, was first arrested in Iran in 2009 but released after agreeing to cease all house church activities. Given permission to do humanitarian efforts, Abedini traveled to Iran from Idaho over a half a dozen times to work on building an orphanage. During his imprisonment in Iran, his then wife, Panahi, campaigned continuously for his release and even met with President Barack Obama. Hundreds of rallies and prayer vigils were held across the nation as influential evangelicals, including Pastor Greg Laurie of the Harvest Crusades and Franklin Graham, advocated for Abedini's release.